You’ve heard it said, “When it rains, it pours.” In gardening terms, this could easily refer to the amount of rain on the roof going through the gutters and downspouts, and then out to the storm drains and pouring away from your garden. With the unpredictability of rain and the cost of water, don’t you wish you could keep some of that rain and put it to better use? You can, by installing a rain barrel, or two, or three or more. 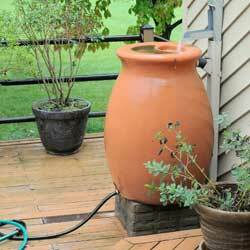 Rain barrels don’t have to be expensive or an eyesore. By diverting the gutter downspout to the rain barrel, rainwater is collected during a storm and stored. A fine mesh screen across the top prevents rocks and debris from entering the barrel and mosquitoes from laying their eggs. It’s a good idea to use a small amount of algaecide to prevent algae from building up in the barrel as well. Some barrels even have a solid cover with an opening to fit the downspout into, and the darkness inside the barrel helps inhibit algae growth. Most rain barrels have two spigots, one at the top and one by the bottom. Attaching a hose to the top spigot redirects excess water when the barrel is full. You may use this to connect to another rain barrel that stores the overflow from the first, or you may position the overflow hose to direct excess rain to a nearby flowerbed, tree, garden or other plantings that can benefit from a good soaking. A hose attached to the bottom spigot allows the stored water to flow for use. Incidentally, the water pressure increases if the rain barrel is elevated even just a few inches, allowing gravity to assist getting every drop of precious water out of the barrel so it can be put to use. Is it worth it? According to the United States Geological Survey (USGS), a rainstorm measured at 1/10th of an inch, over a 20’x30′ roof, would more than fill a 32-gallon rain barrel if all the water is properly directed. Multiply this amount by your water charge per gallon and you’ll see it won’t take long to pay back the small investment made in a few barrels. Furthermore, rainwater is often better for watering garden plots, containers, flowerbeds and new plantings, and is even better for many houseplants. Rainwater does not contain the same chemical treatments or compounds found in tap water, so collecting rainwater is a healthier alternative for keeping all your plants well hydrated. 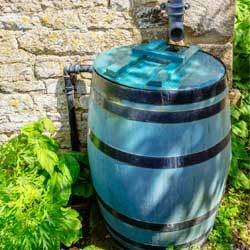 Not sure which rain barrels will suit your style or how to set them up effectively? Stop in to see our collection and consult with our experts to choose exactly the barrel that will help meet all your watering needs. This entry was posted in Gardening Basics, Late Spring on March 28, 2018 by admin.